"Count" the (YouTube) views: The Sesame Street family, hoping to become the first nonprofit media organization to hit 1 billion video views, issued a challenge to its world-wide followers: Help us reach one billion channel views and we'll reward you with a "top secret" video. And while no one knows if it was "Elmo's Song" or Cookie Monster's "Share it maybe" that pushed the YouTube channel over the 1 billion mark, Sesame Street fans delivered. PBS happily released the video on Wednesday, which already has more than 60,000 views. 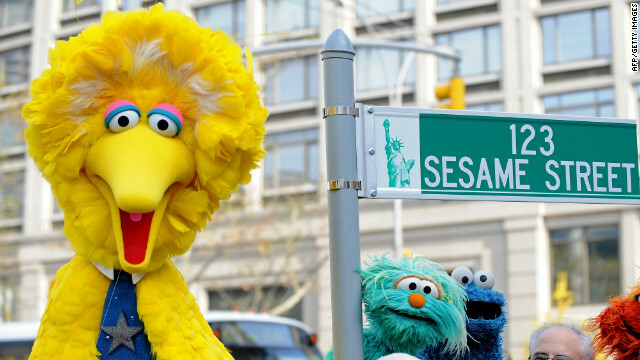 Can you guess which Sesame Street character they used? Held hostage: In the April issue of Vanity Fair, NBC News's Richard Engel details what it was like to be held against his will in the midst of Syria's civil war. For five days, the foreign correspondent was mentally and physically tortured by the shabiha militia, an armed group who supports the Ba'ath Party, of which Syrian President Bashar al-Assad is a part of. In the diary-style excerpt, Engel writes of his initial capture, as well as his first few minutes in captivity: "Stay focused. You are here. You need to survive this. The first few hours are the most dangerous." Free Lunches: As the saying goes, there's no such thing as free lunch, especially when you're an online freelance journalist trying to make a living. Case in point: After an Atlantic editor extended an invitation to Nate Thayer to publish a shorter version of one of his already-published pieces (but made it clear she would not be paying him for the piece), Thayer published the exchange of emails between himself and the editor, Olga Khazan. The Atlantic has since come out, calling the situation a "mistake." Controlling the Cardinals: Following a tiff between White House press corp and the Obama administration over access to a presidential golf outing, international journalists are experiencing their own press battles after the Vatican cancelled an American press briefing with cardinals. "The American cardinals are just more used to being open and talking to the press and answering questions in public. Rome just doesn't like to operate this way," said Father Thomas Reese of the National Catholic Reporter. So does the Vatican have a right to silence their clergy? And what stories caught your attention this week? Please remove my phone number from the prior post. Thank you. Poppy Harlow's piece on the Chinese immigrants housed at 81 Bowery (sp?) resulted in the NY Fire Department closing down this substandard, but affordable housing for dozens of people. What her report seriously lacked was some analysis of what housing these immigrants can now obtain. What is the City's housing program doing to finance single room occupancy hotels for people that can only pay $100 to $200 a month in rent? Where will these men go? Previously the NYFD was probably looking the other way, but CNN's reporting made it impossible, which is not to say substandard housing is appropriate. What is the Fire Department or Building Department doing to require the landowner to rehabilitate these units so they are safe? What subsidies, if any, are available from city, state or feds to underwrite the effort and keep these units affordable? This is a very complex human story, that was reported in an extremely naive and simplistic sound bite style. Just because someone in the private sector is breaking the law, does not mean that enforcing the law has no consequences. What is the responsibility of a reporter , when they know their reports will cause human suffering? Obviously the landowner knew it was substandard housing from the level of complaints, and was reaping the benefits of tax deductions and depreciation write offs, but not making it safe so his or her own family members to live in. CNN should follow this story, and what happens to these residents, as well as research and run a story on the housing situation for the poorest of the poor, immigrants or not. Poppy Harlow's reporting was seriously deficient. Feel free to call me with further comments. 916-443-3509. Thank you.